I booked this trip online for 759 Bath at the end of February 2016. The ticket includes a voucher for food at the stop about halfway of the trip. 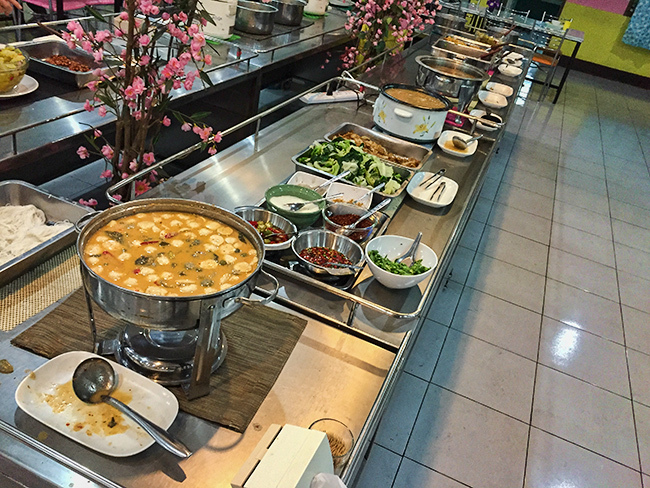 You find a few pictures of the food below. The bus leaves Chiang Mai at 20:30 and was in Bangkok at 6 in the morning. Most passengers got off at the Bangkok Bus Lines office but the bus continues to Mo Chit since that is what you paid for! They might tell you that it does not so you have to insist on it. They will drop you there. Bangkok Bus Lines have a counter at the bus station in Chiang Mai if you want to get your ticket there. You can come to the station a few hours before to get it. This usually works off-season but if you want to travel in high season you better get a ticket in advance. The same goes for the bus from Bangkok to Chiang Mai. You can get a ticket at Mo Chit Bus Terminal. Sometimes it is also called Northern Bus station or Chatuchak Bus station or Terminal. Quite confusing but all the same. This is a 32 seat bus with a 1 – 2 configuration. 1 seat on one side of the bus and a double seat on the other. Since there are only 3 seats in a row you have more space. 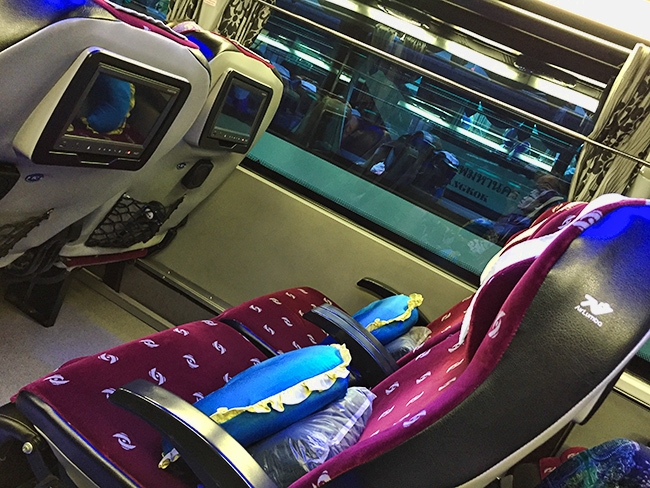 The seats are wider and there are fewer seats in the bus. If you want to sit together with your friend or sit alone you better book online a few days before. This way you can choose your seat. The toilet is in the back of the bus. So you want to sit in the front or middle of the bus. The toilet door makes some noise. And it might smell from time to time. But this is the same as all the busses that come with a toilet in Asia. The seats do recline quite a bit and have a nice footrest. The footrest is only useful when you are not too tall. If you over 190 cm you might look for a 24 seat VIP bus to use the footrest. I am 203 cm and had no problem in this bus apart from the footrest that I can not use. You get a blanket and a travel pillow that goes around your neck. Never had one of those on a bus. They are better than a pillow alone but I am not sure if they wash them all the time so I did not use it. But you could use your T-Shirt or towel if you want to use them. Great entertainment system. You can even charge your USB device. Lots of movies to choose from. Even a few in English. 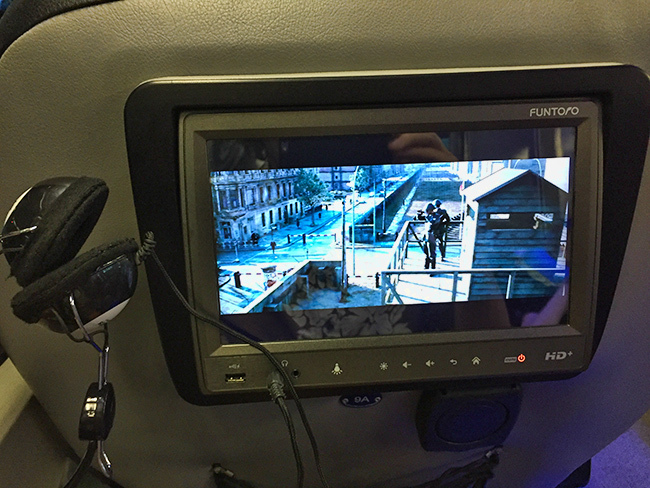 The headphone is from the bus as well but you can use your personal one if you like. You get a small bottle of water and this box – I only eat the chips. 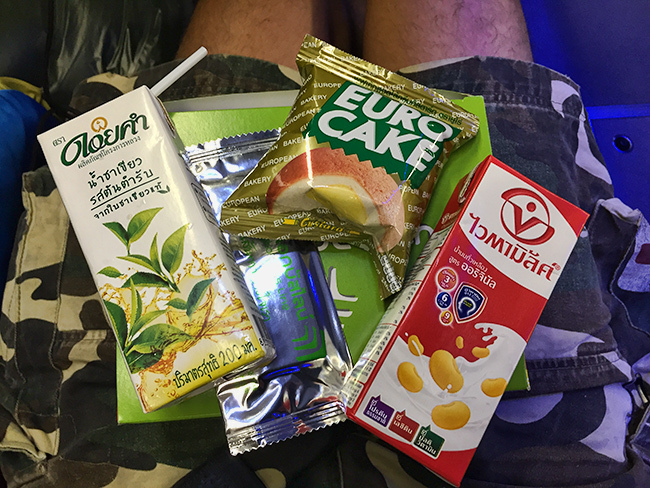 The rest I gave to a homeless guy that sleept close to my hotel on the streets in Bangkok after we arrived. He looked happy. 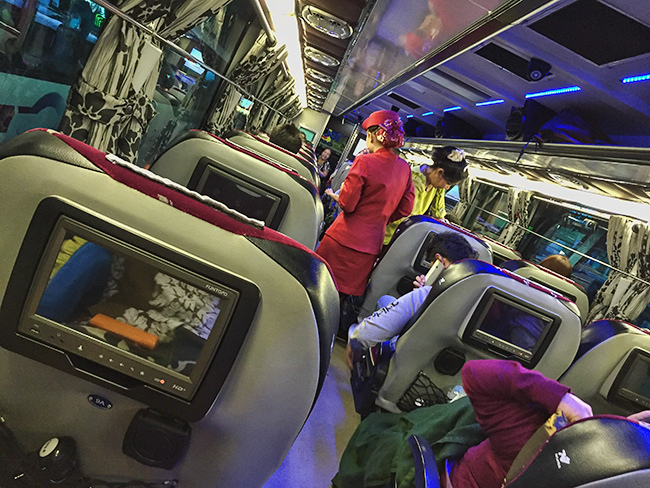 Since that is a VIP bus you can eat in the VIP dining area of the food stop midway to Bangkok or Chiang Mai if you go the other direction. That means more options and buffet – you can eat as much as you like. Usually, the vast majority of the buses stop at a rest stop where you have a very limited option of meals. 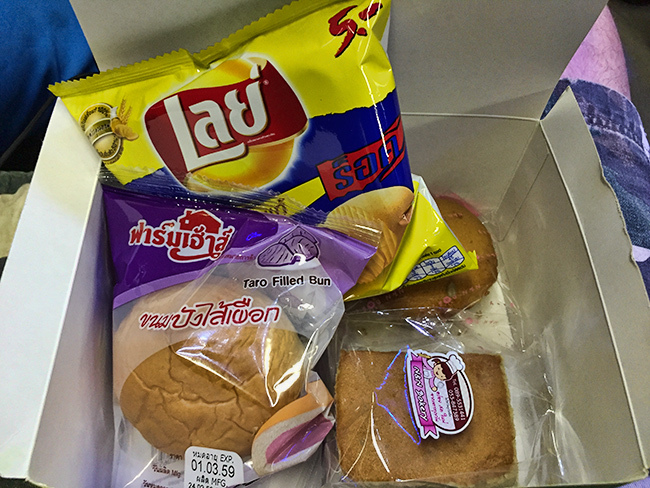 In any case, keep your ticket – it has the voucher for the food on it. 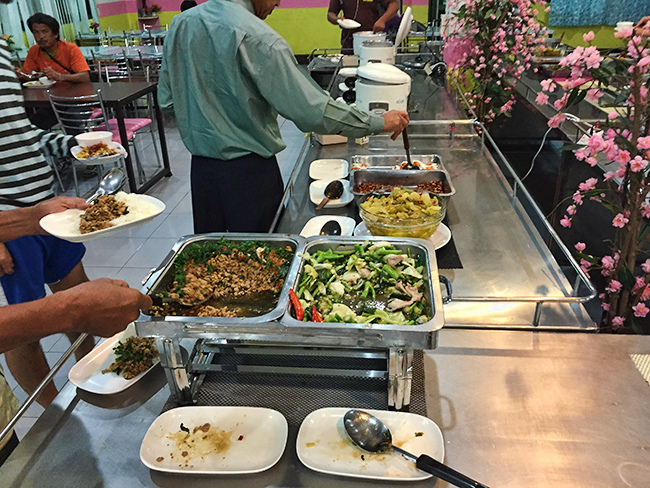 There was even some for me – vegetarian food that is! Here are the buses 12go sells online. Be aware that there are other bus companies as well that do not sell online tickets. If you need to go to Bangkok from Chiang Mai or Chiang Mai from Bangkok you will find a bus easy if it is not high season. 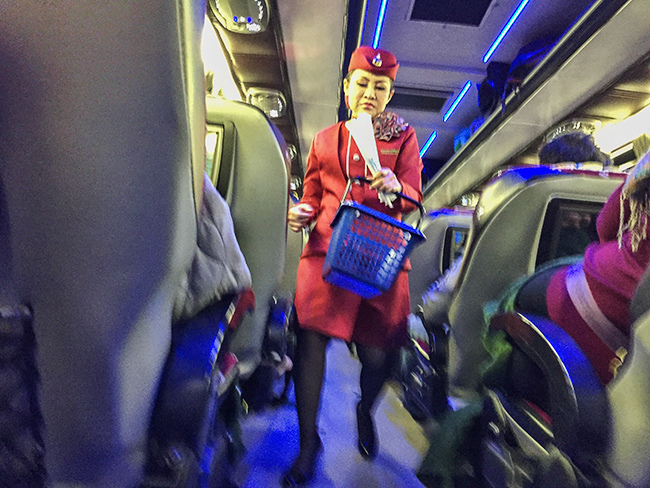 It might not be a VIP bus but you should get to Bangkok or Chiang Mai.